tempohari.com — Brings the features from Android Oreo to your notification center and adds a ton of customization on top so you can make your device stand out ✨. • Stock themes: Nougat and Oreo based themes. • Full color customization: Take the base layout and color all the elements to your taste. • Powerful notifications: Get it, read it, snooze or dismiss. • Quick reply: Reply to your messages as soon as you see them. For all Android 5.0+ devices. • Auto bundled: Tired of that one app that spams you notifications? Now they’re all grouped together, for easy control. 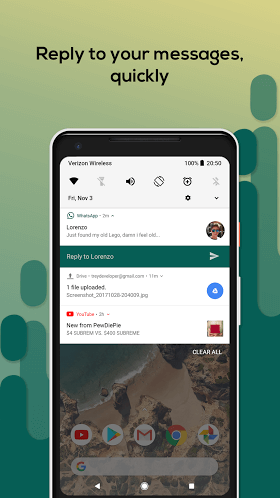 • Notification card themes: Android 8.0 Oreo inspired. – Colored: uses the notification’s color as the card background. Only applies the background if the color isn’t dark for contrast purposes. Since the app doesn’t actually change any parts of your system it has limited power in the quick settings area (cannot toggle mobile data, location services, etc so it opens the settings page for you). You can grant it root access though to control these settings.